For decades the Gillespie Corporation has manufactured both Vertical Reciprocating Conveyors (VRC’s) and freight elevators. VRC’s are excellent for moving material when riders are not required. 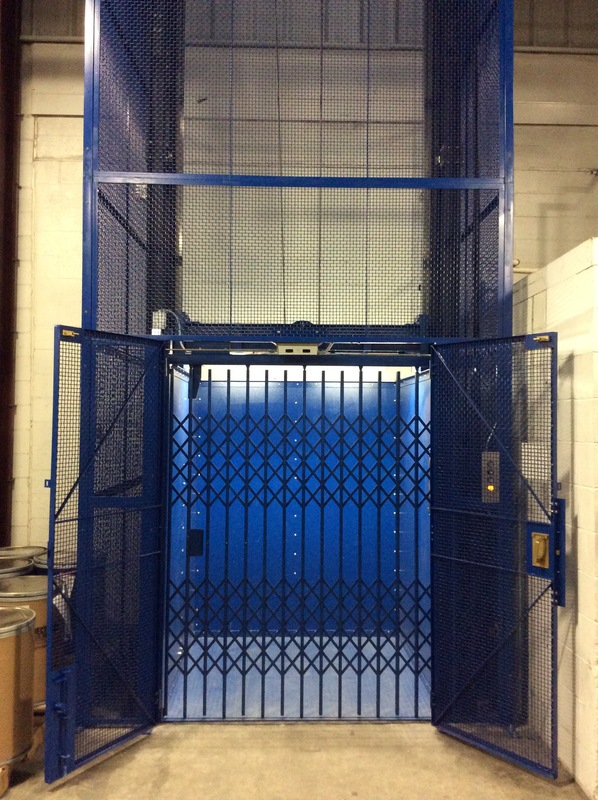 The traditional solution for applications where riders are required is a freight elevator requiring a fully enclosed cab and an enclosed hoistway. However, Gillespie has recently developed a low-cost alternative to freight elevators that will allow riders. When Mobility Elevator contacted Gillespie looking for a material lift with limited pit depth that could be ridden by authorized personnel, a Type B Material Lift was proposed. This type of lift has its own section under A17.1 and allows riders. 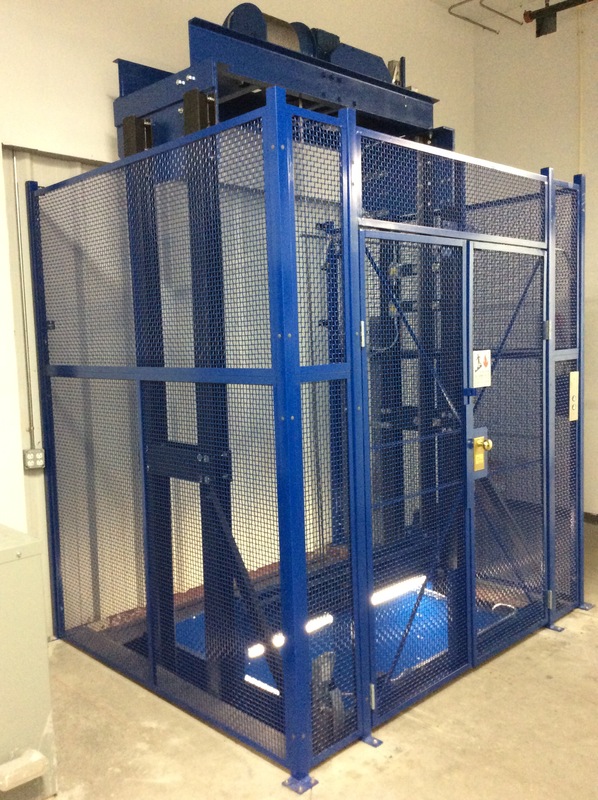 Mobility Elevator’s customer, Spectrum Chemical, wanted a low-cost lift to move material that could also be ridden by factory personnel. Typically, this would be accomplished with a freight elevator which, due to elevator code requirements, would result in a substantive increase in equipment and hoistway construction costs. The lift provided has a 5’ 4” by 5’ 4” platform; the travel is 20’, and the capacity is 3,000 pounds with a speed of 30 fpm. The pit depth is 5 ¼”. The car is guided by two 15 lbs/ft t-rails which are connected to W-beams for stability. There is 13’-4 ½” of overhead and the car is lifted by an overhead drum machine with a 5.4 hp motor. Due to the limited pit depth, non-removable safety devices were required to satisfy the bottom car clearance. When deployed, the safety devices stopped the car 60” above the pit floor. 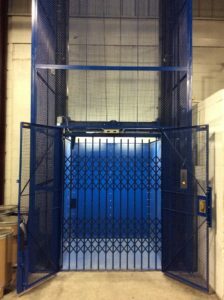 Although it is not required per code, the customer requested that the lift be provided with a Gillespie c ollapsible car gate. All the structural steel on the lift was powder coated blue, as were both the upper and lower landing wire mesh enclosures supplied by WireCrafters. The lower landing enclosure is 19’ 3” high, while the upper landing enclosure is 8’ 5” high. Each enclosure has a 5′ 2” wide by 7’ 0” double swing gate so that larger materials can be loaded onto the platform by forklift. The gates are fitted with interlocks to ensure that they can only be opened at the floor the where the car stops. The non-removable safety devices are mounted to the guide rails and are deployed and retracted by linear actuators. There are also two micro switches that monitor the position each safety device. One microswitch prevents the car from running unless the safety devices are fully retracted while the other micro switch prevents access to the shaftway unless the safety devices are fully deployed. Control stations are located at the lower and upper landings and the lower landing control station also has a key switch to control the safety devices. Additionally, there is a car operating panel (COP) in the car for use by authorized personnel. The lift has upper and lower normal and final limit switches. To operate the lift, it is first called to a specific landing. Once it reaches the landing, the retiring cam extends and releases the interlock so the wire mesh gate is unlocked. From here the lift can be loaded with material. The lift can then be either called or sent to the other landing. When the lift is called to another level the retiring cam retracts, locking the wire mesh gate and the lift begins traveling in the shaftway. 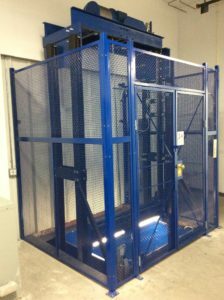 As demonstrated by the Spectrum project for Mobility Elevator, the Type B material lift designed and manufactured by Gillespie provides a practical, flexible and less expensive alternative to the traditional freight elevator.